Iulia started to paint at very early age; in her teen years, while living in Romania, she admired the impressionist and post-impressionist movements and especially Cezanne, therefore she approached painting in a realist-impressionist manner being also influenced by the local artists in her hometown Craiova. She completed her art training at Academy of Realist Art in Toronto where she learned the classical realist techniques of drawing and painting while continuing throughout the years to paint a la prima portraits. 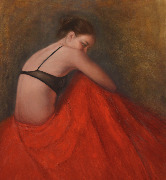 "I see myself as a realist figurative artist; I use direct painting or classical approach, hoping that the technique I choose will reflect my interaction with each person I portray. People around are a great source of inspiration, I find that in portrait and figure there is always something left unexplored. A special joy for me is to paint women of all ages; I'm fascinated by this (possibly) life-time project and I'm sure I will enjoy every moment. "